The New York Red Bulls have signed forward Brian White to an MLS contract, the club announced today. White becomes the eighth player from New York Red Bulls II to ink a first team contract. "We are pleased to add Brian to the first team," said Red Bulls Sporting Director Denis Hamlett. "We liked Brian's qualities when we drafted him, and he has continued to develop and show that he fits our style with Red Bulls II. He has earned this opportunity and we look forward to seeing how he can contribute at the First Team level." 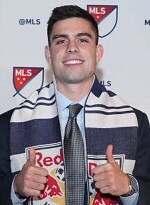 White, New York's first-round pick (16th overall) in the 2018 MLS SuperDraft out of Duke University, signed with NYRB II ahead of the 2018 season. The Flemington, New Jersey, native has appeared in all 22 matches, tallying eight goals and five assists in 1,449 minutes played. White became the first player in USL and MLS history to record a goal, an assist and a save in the same match against the Richmond Kickers on July 13. He was nominated for mid-season USL Young Player of the Year. "Brian has earned this opportunity by consistently performing well in training and games and he has shown a real willingness to learn," said Red Bulls Head Coach Chris Armas. "His work ethic and attitude, along with his ability to score goals, gives us confidence that we are adding another attacking option and depth at the forward position. This is another example of the value of our USL team and the tremendous job that John Wolyniec and his staff continue to do in developing players." White also competed for the Red Bulls' Premier Development League side in the Summer of 2017, scoring 17 goals along with three assists. The 5-foot-11 forward was named the PDL's MVP for his incredible performances over the course of the season. White also had a standout career at Duke, scoring 23 goals and adding 11 assists in 73 appearances, including 63 starts. He was twice named an All-ACC player and also earned ACC Honor Roll and ACC All-Academic team recognitions.